Hanebado! Episode 1 Reaction/Review l SOLID FIRST EPISODE! 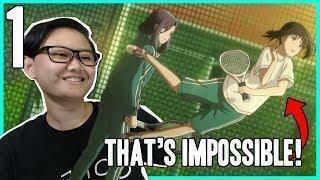 Ike’s reaction/review of episode 1 of Hanebado! and what a solid first episode! Bravo! 10/10 Will continue to watch. After Uma Musume and this first episode, editor Ike thinks that I should stop making reaction videos of sports anime. Every time I open my mouth, I can’t help but to say, “When it comes to sports anime.” Hi, yes, this is know-it-all Ike who doesn’t actually know it all but she pretends to. That paragraph is a mess. Good thing I don’t write anymore amirite? Am I about to invite a bunch of actual know-it-alls who will try to correct me for the rest of the series and onward? Whoops. Better oil up my search engine. Fake reaction because I’m not hyped enough. Tachibana Kentarou is a high school badminton coach who has a lot more enthusiasm than some of the members of his very small team. One day, he meets the quiet-voiced student Hanesaki Ayano, who is effortlessly physically capable and experienced in badminton. He tries to recruit her, but she seems to have no interest in the sport at all. Due to a series of circumstances, she eventually ends up joining the team. Coach Tachibana is determined that with her on board, they’ll be champions!